Introduction to Psychology-1st Canadian Edition is designed to help students organize their thinking about psychology at a conceptual level. The focus on behaviour and empiricism has produced a text that is better organized, has fewer chapters, and is somewhat shorter than many of the leading books. The beginning of each section includes learning objectives. Throughout the body of each section are key terms in bold followed by their definitions in italics. Key takeaways, and exercises and critical thinking activities end each section. To facilitate learning outcomes, three techniques have been used: chapter openers that showcase interesting real-world examples, features that link principles to psychology in everyday life, and close-ups on research. 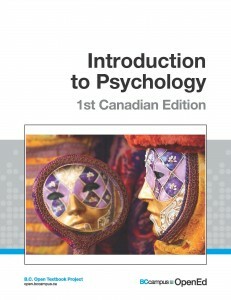 This 1st Canadian Edition is an adaptation (by Dr. Jennifer Walinga) of Introduction to Psychology (by Dr. Charles Stangor). It includes Canadian specific content, images and references, and two new chapters: “Introduction to Major Perspectives” and “Stress, Health, and Coping”. This book is release with a CC-BY-NC-SA open license, with the exception of the additions made, that are licensed with a CC-BY open license. As part of the release of these new textbooks, BCcampus is actively soliciting reviews by qualified British Columbia faculty for these books. If you would like to review this textbook, please contact us. We provide a $250 stipend for faculty who review a B.C. open textbook.